Does Bigfoot Know What A Camera Is? To this day, we struggle with getting the elusive Bigfoot on film. 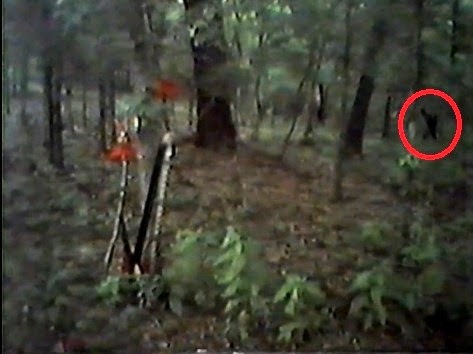 There are very few pictures or videos of Bigfoot that have been deemed credible and are actually clear. Bigfoot seems to be very camera shy and inherently blurry. With all the thousands of trail cameras out in the woods you would think we could get one good shot of a Bigfoot. Now would a clear photo give us proof of Bigfoot? No, but it could be a great piece of evidence in our search for answers. We seem long overdue for something of value to be brought to the table. Which leads one to wonder, maybe they can smell the human scent or see us putting up the cameras? It's obviously not a natural part of nature if they are to notice it in the wild. Florida Bigfoot researcher Tim Fasano uses many trail cams in his research areas and has captured many different images of animals on them. This is what he had to say about deer noticing the cameras: "In the images above, the deer is looking straight ahead, then she looks right at the camera! In the next frame she takes off. It seems she saw the camera. That may be possible because the Reconyx do give out a slight high decibel sound when they take pictures." Here is a link to Tim's blog post. Despite the deer perhaps sensing the camera, it is still being captured on film. So a Bigfoot would have to be more keen than a deer to know what a camera is, or perhaps they are just that rare of a species to be able to avoid them. In this video M.K. Davis gives some examples of what possibly could be Sasquatch awareness of cameras. Wood Knocks - What Do They Mean?